Basic Chicken Karahi recipe by Amer at PakiRecipes.com. Put chicken in Karahi and add 1/2 cup oil and fresh ginger paste. Fry the chicken for about 10 to 15 minutes untill it become light golden. Add tomatoes, red and black chillies, salt in it and keep it on fire until water of tomatoes dried off. Now add curd green chillies and coriander leave and fry for 2 to 3 minutes . Serve hot with tandori nan. There are 51 comment(s) for this recipe. For those who did not understand curd so for them, its yogurt. In Urdu we call it "Dahee". im english but am a complete lover of all pakistani foods and its the only thing i eat so thank you for putting your recipes on becouse i can perfect them now to a T.
nice traditional simple recipe thanks. There is no such thing as onions in Karahi! It's a crime against humanity if you put onions. This is an authentic recipe, just the way it should be. Great stuff! this looks real karhai chicken!! really this one is v gud website for pakistani girls. they can learn a lot from here. just one thing though,u must use garlic paste instead of ginger,add ginger only and only at the end and that too for garnishing only.make karahion high flame.chicken should be golden and crispy.i learned karahi by standing and watching the open air hotel walas making it. there are NO onions in karahi.go and see in every single chapar hotel,watch how they make karahi.i belief its a crime to put onions in karahi. As far as i know in the real chicken karahi recipe no one puts timatoes directly into the chicken, should fry tomatoes separatly in a vessel till all water is gone only then should be added to the chicken. this recipe looks like a normal chicken curry reciepe. Very easy recepie for a person like me who is going to cook any dish for the first time in life. its my first cooking experince and i have found it quite easy.its nice and simple recipe.it tastes gud.i like it. Put chicken in Karahi and add 1/2 cup oil and 1 tsp salt Fry the chicken for about 10 to 15 minutes untill it become light golden. now remove oil in separate bowl. Add tomatoes, red and black chillies, garlic in it keep it on fire until water of tomatoes dried off. now add ginger and mix it. Now add oil, (adding oil in start will not allow the chicken to absorb the taste of ingredients added with it) and then add crushed cumin (half a tea spoon). Now add curd green chillies, crushed black pepper (half a tea spoon) and coriander leave fry for 2 to 3 minutes. and then when serving sprinkle some crushed black pepper and roasted and powdered (by hand) cumin. Serve hot with tandori nan. this is a perfect recipe. prepared in most of the restaurants. where is the GINGER in the preparation????? oh and i add garlic and too. No black pepper though. Ps.... you forgot to mention the salt. One thing more instead of 1/2 kg tomatoes use only two normal size tomatoes. 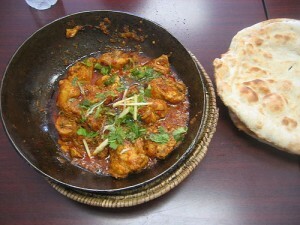 This is the best karahi. I have made it several times. One correction that is: after chicken is turned light golden or white then add ginger. This step is missing that is why some of the viewers are confused. I havent tried this one yet, but it looks very bad. No ginger/garlic, no other spices. I think nobody ever tried making this karahi before posting on the website. this is the worst recipe ive ever seen, put chicken in oil!!! be a bit more helpful to those for whom this recipe is supposed to be destined to. Heat up oil then place chicken in it doh.